Saucy Brew Works, one of Cleveland’s most popular breweries, has partnered with the Cleveland Cavaliers to open Saucy Brew Works at Rocket Mortgage FieldHouse. The brewery-style concession, located on The Q’s main concourse, is the first fan-gathering destination to open in the arena’s new South Neighborhood. The 1,500 square foot beverage-only beer garden will feature a lineup of Saucy’s high-quality craft beers for of-age fans attending the more than 200 diverse live events, games and concerts held at Rocket Mortgage FieldHouse each year. A “first tap toast” to celebrate the grand opening of Saucy Brew Works was held prior to the Cavs vs. Phoenix Suns game on Thursday night at The Q. 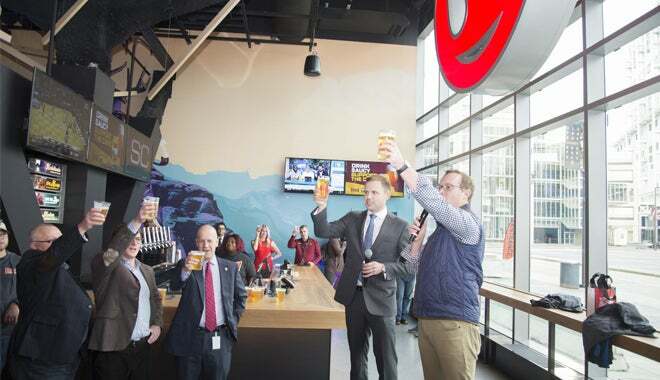 Joining Cavaliers and Rocket Mortgage FieldHouse CEO Len Komoroski and President of Business Operations Nic Barlage were Saucy Brew Works co-founders, CEO Brent Zimmerman and Brew Master Eric Anderson. “The ‘neighborhood’ concept to provide a welcoming and social destination for fans to gather during events was integral to the arena’s updated design as part of Rocket Mortgage FieldHouse Transformation,” said Cavaliers and Rocket Mortgage FieldHouse CEO Len Komoroski. “We are thrilled to have one of Cleveland and Ohio’s top craft brewers in Saucy Brew Works to help anchor the South Neighborhood space and experience." “It’s an honor to be partnered with such a stellar group that is the Cleveland Cavaliers. We take great care and pride in producing superior quality, creative beers and this beautiful new pub is the perfect place to showcase that passion,” said Eric Anderson, Brew Master, Saucy Brew Works. Located on the south side of the arena’s main concourse, the new South Neighborhood will be fully-complete in early March with the openings of two exciting food concepts from local chefs Jonathan Sawyer of the Greenhouse Tavern and Karen Small of Flying Fig, in addition to the official opening of the Discount Drug Mart Entrance. When complete, the new South Neighborhood will add 6,350 square feet to the arena’s main concourse, creating a social gathering hub for all fans to enjoy before and during games and events. Saucy Brew Works at Rocket Mortgage FieldHouse was designed by the Infinite Scale Design group in collaboration with the Cavaliers, Saucy Brew Works and the arena’s food and beverage provider Aramark. The new 1,500 square foot space features an over 50-foot bar made of a solid wood Antique American Oak counter and provides a view of the Cleveland Indians ballpark Progressive Field across from the arena. It also features twelve 55-inch high definition TV’s for fans to enjoy a sports bar-like atmosphere. “We are excited and honored to take our partnership to the next level with the opening of Saucy Brew Works at Rocket Mortgage FieldHouse. I want to thank The Cleveland Cavaliers, Aramark, Infinite Scale, and our Saucy team for the hard work and dedication necessary to pull off this awesome venture, we couldn’t be more excited. We can’t say enough about how much Saucy Brew Works enjoys our partnership with the Cavaliers. It is a true partnership, that is made possible through fantastic people at each organization. Cheers to many great things on the horizon,” said Brent Zimmerman CEO & Co-founder of Saucy Brew Works. IPA ASAP: American India Pale Ale - crisp, dry and citrusy with a lingering bitterness - 7.0% abv. HABITUALE: Kolsch Style Golden Ale - light, clean, crisp with a slight citrusy, spicy character – 5.3% abv. I CAN’T EVEN – Hazy Peach IPA – deliciously juicy and brewed with Michigan Copper Hops – 8.0% abv. Founded in 2017, Saucy Brew Works is a Cleveland-based brewery serving up a wide range of high-quality craft beer with the likes of classic German, American, Experimental Yeast and Wild Type beers. The Saucy Brew Works brewing system, aka The BrauKon, is efficient, exact and eliminates waste. Saucy Brew Works only uses food grade stainless steel, from the tanks through the draft lines, which is the best way to deliver the clean, pure flavor of great tasting beer that satisfies. For more information regarding Saucy, stay connected on Facebook, Twitter and Instagram, @SaucyBrewWorks, or visit www.saucybrewworks.com.